Ceann de na Lochanna Móra i Meiriceá Thuaidh is ea Loch Huron agus í suite i lár Meiriceá Thuaidh, idir stát Michigan sna Stáit Aontaithe agus cúige Ontario, i gCeanada. 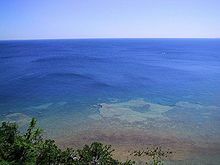 Labhraítear faoi mar loch inti féin, ach go teicniúil is é atá ann ná an leath thoir de Loch Michigan-Huron. Téann uiscí Loch Superior agus Loch Michigan isteach i Loch Huron agus imíonn an t-uisce ón Loch ó dheas tríd an abhainn St. Clair go Loch Erie ar a bhealach mall go dtí an t-Aigéan Atlantach. Is é 22 bhliain am seadaithe an uisce sa loch.